Grabner Nominated for Calder; Will He Win? In what was pretty much just a formality at this juncture, Michael Grabner was nominated for the Calder Trophy after having a rookie season to remember. 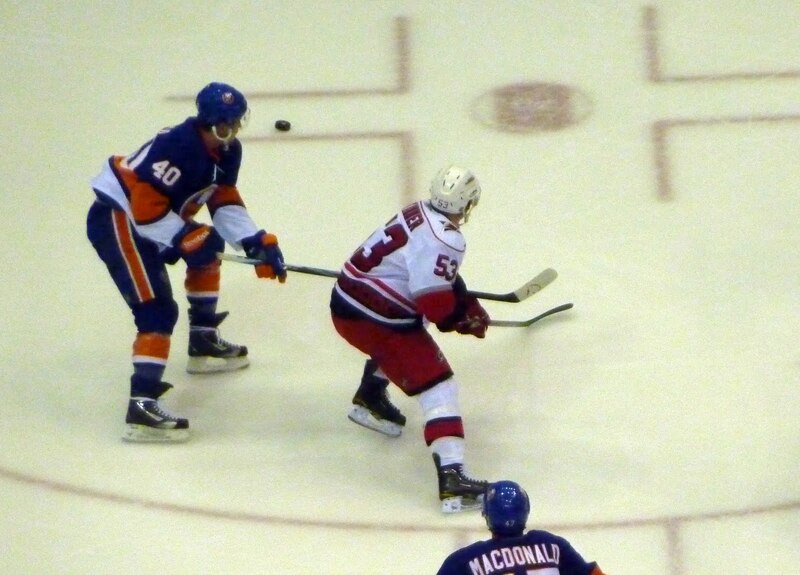 Grabner scored 34 goals for the Islanders this season. It's funny to look back on things such as this and realize how much of a surprise it was. Throughout training camp, it was widely thought that if Grabner didn't make the cut, Florida could very well waive him. In all honesty, if you told m they would when camp opened I would have laughed and said you were crazy. In our preseason "Face Off," Sean and I both agreed that you could put Grabner down for 20-25 goals once he got going. When he did eventually get going, he would far exceed that. Here's the scarier thought: when he really got going in January-ish, he was sitting at about nine goals. He scored at quite an alarming rate, and did so while often getting 15 minutes of ice-time or less per game, and not a whole lot of power-play time. But are Grabner's accomplishments enough to put him over the top against his competition in Carolina's Jeff Skinner or San Jose's Logan Couture? This is the first year that I can recall where there were a number of strong candidates. Between these three, Corey Crawford, Sergei Bobrovsky, P.K. Subban and a few others, some players who had fine years were going to be left out. While some people think that the Professional Hockey Writers Association strike will affect who wins in the end, I really don't think it will move enough mountains for Grabner to win the trophy. Besides, this boycott started well before the ballots were handed in, and the fact that he's been nominated pretty much puts to bed any idea that this will really sway the voting in one of the other impressive youngsters’ direction. In my eyes, you'd be hard pressed to not vote for Jeff Skinner. Sure, you can say Skinner had a better team around him. Steve Stamkos had an even better one around him in his rookie year in 2008, however and didn't have the year that Skinner did. We can also sit here and discuss how Carolina didn't make the playoffs, so Skinner's season doesn't mean as much. Be that as it may, you would be foolish to do that. What this 18 year old with a boyish face did - in a men’s league - is absolutely astonishing. Especially when you take into account he was a fairly little known 8th overall pick. Taking a look back over time, there haven't been many players who went from a late top-10 pick to being a regular on an NHL team in a matter of months. The previous two? Sam Gagner (6th overall in 2007) and the Isles very own Josh Bailey (9th overall in 2008). Neither has come close to having a season like the 31 goal, 32 assist campaign that Skinner did at any point in their combined seven years of service. It is very tough to come from the back of the top-10 and contribute right away, but that's exactly what Skinner did. I know my thinking is probably not one of the more popular ones around here, and some of you had made it known during our final show of the season. That's all well and good. Just remember that the rest of the competition is very impressive to, however. I think when you look at some of these facts, while Grabner will put up a great fight, he will most likely finish a close second to Skinner. I understand Skinner has more of the media behind him and whatnot too, and yes that does play a big part. What bothers me a little bit is when people say this as if it's a bad thing. In my opinion, all of the talk around Skinner is well deserved. People should be more in awe of his feat rather than talking about NHL bias and how that will be why Grabner doesn't win. The fact we can be having a discussion like this is excellent news for the Isles, Canes, Sharks and the NHL. A rookie class like this is something the league needed, and it's good to see they finally got one. At any rate, Grabner has his work cut out for him. Congrats to him for the well deserved nomination, and good luck! On a day when Jack Capuano had the interim label removed and was given the reigns for the next few seasons as the man behind the bench, the Islanders weren't as lucky. Tuesday night the NHL held their annual draft lottery. The Islanders sat with a 10.7% chance of winning the lottery and moving up to the top pick. Unfortunately, it was the New Jersey Devils and their 3.6% odds that would prevail on this night. It seems fitting for the Devils to get the pick. All they did for much of the last few months is win, and after just falling short of the playoffs they seemed to have just a little bit more luck in them for one more victory. After hitting the lottery, the Devils will move up to the 4th spot from 8th. The Islanders, who held the 4th spot going in, move down to 5th as do the other teams down the line to Columbus who now takes the 8th spot. Just before the lottery show started, I made the comment that I had an odd feeling that a team not in 1st was going to win and jump up. It seemed that statistically speaking, it was time. The previous three seasons saw the worst team win the lottery and retain the first pick. The Islanders will still be able to pick a solid player at 5th, but unfortunately for me that player most likely won't be center Sean Couturier. Unless of course a few NHL teams are buying what the scouting services are selling and he is slipping in their rankings. More importantly, it emphasizes the Isles need to have a good offseason. As we said on the show this past weekend, this team can ill afford to have another offseason of just drafting high, putting that player in the line-up, signing guys who have toiled in the minors and hoping for extreme maturation (or in some cases exceeding expectations) across the board. Now, it most likely makes it a little bit tougher to justify putting the player we pick in June on the roster in October (forget for a moment the ability to have players come in for nine game "try outs," of course). INTERIM NO MORE: Regardless of who is on the roster next season, we know that Jack Capuano will be behind the bench coaching them. The Islanders officially removed the interim tag off of Capuano as they made him the official head coach. Of course, this was all just a formality by this point. When you look at what Capuano had done with an injury ravaged roster, it is quite a feat. Neither Sean nor myself were happy with the decision to fire Scott Gordon back in November. Sean wasn't a big Gordon supporter from the get go, but given what the team was we both felt it was a bit unnecessary. I can't speak for him, but I can speak for myself and say I have been pretty impressed with Capuano. I didn't think he would come anywhere close to doing what he was able to do, but I was flat out wrong. This was the right decision for the team to make, especially since they still qualify as up-and-coming. Could they have gone out and looked at the Todd Richards' or Corey Clouston's of the world? Sure, but at this point if something works, don't mess with it. The best coach in the world isn't going to make this current team as constructed into a contender over night. It's nice to have this situation settled barely into the off-season too. I remember how frustrated I was back in July 2008 when the Islanders fired Ted Nolan, which was a long time after teams normally would make coaching changes. There were still plenty of candidates to choose from, but it seemed odd to wait that long to fire a coach. At any rate, good job by the Isles and congrats to Capuano. This is well deserved. For those who watched the ups and downs all season long, the final two games of the 2010-2011 season may have looked awfully familiar. That's because they were both perfect representations of this season and the future. Everything that went right, that went wrong, that could use improvement and that are set for the future were seen. On Long Island on Friday night, the Islanders came out very slow. Pittsburgh would get a 2-0 lead, but the Islanders - behind a very inexperienced defense changed the pace of the game, came back to tie it and took the game all the way to the shootout. This against a team that has been without it's two biggest stars since January, and yet had found themselves vying for the Atlantic Division Title up until the very last day of the season. The fact that the Islanders tied the game up with 35 seconds remaining showed the grit and determination that we have seen for much of the time from mid-December until now. Losing in the shoot-out to a team like that by only 1-0 shows that we're almost there. That was what everyone felt like after the prolonged losing streak ended in December. A lot of "almosts," a lot of "not quites." But the change happened before our very eyes. Saturday night in Philadelphia, the Isles went into a building that has not been kind to them. It took 47 seconds for the Flyers to build up a 2-0 lead. The Islanders would battle back again, tying the game twice before taking a 4-3 lead. After a few weak goals, they found themselves trailing again. In net for the Flyers game was Rick DiPietro. His play left a lot of folks frustrated to say the least, and that too is a statement for how his season went. Not only was it frustrating at times to watch, but it was frustrating for the team, for Rick and for the NHL. I guess, if you're looking for a positive out of that situation it's that DiPietro ended a season healthy. Considering how things have gone for him, that is a step in the right direction. He now doesn't have until September to rehab something like last season. Now, he can perhaps regain some strength that may have been lost. He'll have that extra time now that won't be spent trying to come back from injury, but in trying to get back to where he was and hopefully be a capable netminder for a half of a season. Michael Grabner capped off his rookie season by scoring his 34th goal. P.A. Parenteau wrote the last chapter in his Cinderella story for this season by getting his 20th goal. John Tavares scored one of his own, but fell one short of the 30 goal plateau. Travis Hamonic scored his 5th goal of the season, on the powerplay. The 20-year-old was up much earlier than any of us expected. You'd be hard pressed to find anyone out there who thought he would stick around for as much as he did. But by the time we all expected him to be back down at Bridgeport, Hamonic was a mainstay on the Isles first pair, getting 22+ minutes a night quite often. He became the first Isles rookie defenseman since Denis Potvin to register 20+ assists and 100+ penalty minutes this season. While neither of these efforts resulted in wins, I was glad to see them battle back and keep things interesting against two of the toughest teams in the East this year. It's hard to see that silver linings at time, especially in a season where you didn't finish with as many points as the previous year. But it is there. We're almost there. A lot will be riding now on this offseason. Howie Rose summed it up perfectly when he said as the final seconds ticked off of the clock: "For once, a summer of optimism is ahead." Here's hoping you're right Howie. The players have shown us a little bit. Now it's your turn, Garth Snow. TUNE IN SUNDAY MORNING! As we begin to tie a ribbon around this season, Sean and I will be on one more time live for NYI FYI tomorrow morning at 11 AM. You can watch us by tuning into our UStream page. Come with your questions and comments and participate in the chat room. We'd love to hear from some of you. I'll have a couple of reflection type posts within the next few days, so just because the season's over and our show will take a bit of a break doesn't mean we'll be completely silent. Be sure to continue to check up on us, as we'll surely do for some of you. The hockey world received some sad news on Thursday when we all found out about the passing of NHL Central Scouting Director EJ McGuire, who lost his battle with cancer. McGuire was 58. In all honesty, I had no idea that EJ was sick and when I logged on at lunch time and saw the news I almost choked. EJ was a guy Sean and I hoped to get on the show in the near future to talk about prospects. He was such a great hockey mind, and one of the most involved folks when compared to others who hold high positions around the sport. When prospect videos were released, he was always the scout talking about the player and could talk about seemingly anyone for any length of time without needing much material in front of him. He never judged a player solely on his numbers. It's folks like him that make people know so much about the future of this sport. EJ's insights were something I would go out of my way to find in order to brush up on a prospect I did not know. More importantly, McGuire passing away at such a young age is really a killer. Our thoughts and prayers go out to his family. ISLES - BRUINS THOUGHTS: Michael Grabner tried his hardest to give the Isles a win over the struggling Bruins, but in the end it wasn't meant to be. Grabner scored two goals - one on the power-play, the other short handed - but the Isles could not overcome two quick Bruins goals in the 2nd period and lost 3-2. For the Islanders, it was one of the better efforts they have had in a loss lately. Rick DiPietro, in my opinion, looked the best he had in a number of games. Early on he made some nice saves and really kept the Islanders in the game. On the Bruins 3rd goal (Greg Campbell), Mark Katic looked just plain silly. I have a hard time faulting DiPietro for something like that. Speaking of goalies, Wednesday night they needed the netminding to be stellar as they were icing five defensemen with under 60 games played in the NHL. The newest member of the defense, courtesy of injuries to Jack Hillen and Milan Jurcina, was Matt Campanale. Campanale actually has a cool story about how this all came about, starting with originally planning spring break, to signing an ATO with the Sound Tigers, to signing a one-game ATO with the Islanders. Campanale would only get 8:21 of ice-time, and it's difficult to really say how he played. I don't recall seeing him make any glaring mistakes in his brief time, but he didn't do anything spectacular either. Congrats to him and his family, as he can at least say he played one game in the NHL. Who knows what happens to him in the future. In the meantime, he'll go back down to Bridgeport where he had only played two games thus far. Josh Bailey had a better effort than he's had in the past. He was cutting to the slot area at the right times to get passes and good chances on net. If it were anyone other than Tim Thomas in net, Bailey may have ended with a couple of points to show for all of his troubles. But Thomas was very confident in net, coming far out of his crease at times to make saves. Twice Thomas made miraculous, sprawling saves on Bailey. Radek Martinek looked a bit shaky, and has in the past few games. I'm chalking that up to the defensemen that he's being surrounded by right now as the clock winds down on the season. John Tavares played well, had a couple of penalties and didn't get on the score sheet. However, one thing I did notice that perhaps some of you picked up on as well (if Jiggs and Butch discussed it then I didn't hear it) was that he was wearing an 'A' on his jersey with Frans Nielsen now out for the remaining games. There aren't a ton of options on the ice right now, but I do think it's rather telling that Zenon Konopka, who has pretty much been the voice for the team all season long, did not get a letter to close out the year. I think the team has plans to try and explore other options for their money. All in all, while it wasn't the greatest effort it certainly was not the worst. It's a shame that a decent start by DiPietro and some great play from Grabner goes to waste, but that's what happens when you play extremely short handed and have such a green line-up. The Isles now get to return home for their last home game of the regular season as they take on the Penguins. I will be at this game, but not in the press box. I'll be a paying customer for the first time in a couple of months. I'm really looking forward to sitting down in the seats one final time this season. If anyone is expecting similar stuff to go on like the last time these two teams met, then I'm sorry. Neither I, nor many other folks are expecting much of anything to transpire. This is a very good Penguins team battling for home ice advantage right now, and what they have done without Sidney Crosby or Evgeni Malkin is commendable. A win for the Isles would be huge here. BROCK NELSON HURT: On Thursday night, Isles prospect Brock Nelson was taken off the ice in a stretcher during UND's final four match-up tonight with the University of Michigan. He was taken to the hospital as a precaution, and the team is calling it a lower body injury for the time being. Hopefully it really is one big precaution. This team has had enough injury and the NHL and AHL level that they don't need it dipping into their prospect pool right now, especially with some of those higher quality prospects playing big games at this time of year. The Carolina Hurricanes knew they had what was essentially a do or die game for them as they came into the Nassau Coliseum on Saturday night for their final match-up with the Islanders this season. By the time the game was over, everyone saw why this is a team that is very much still in this playoff race. Despite the Islanders getting a 2-1 lead and then proceeding to control the play for a good chunk after that, the Hurricanes did not back down and would score three unanswered goals in the third period on their way to a 4-2 win. Every Rangers fan was rooting for the Isles in this one, and for a decent portion of the game they were getting exactly what they wanted. However, things would quickly fall apart for them. After the Hurricanes won, the Sabres played a back and forth game with the Capitals, earning a point as they lost in overtime. The Toronto Maple Leafs also won as they defeated the Ottawa Senators 4-2. The Rangers have a Sunday afternoon date with the Philadelphia Flyers, and they sit one point behind the 7th place Sabres and one point ahead of 9th place Carolina. The Islanders, meanwhile, put up a good fight against another team that has been playing some really strong hockey of late. The same individuals who have been carrying the Canes were at their top of their games - guys like Eric Staal and Erik Cole. Jesse Joensuu was one of the top Isles forwards. I feel this was clearly one of the better games I've seen him play. Earlier this season, I felt he was playing well but I was clearly in the minority when the Islanders sent him down shortly after that. I think there is still a decent amount of untapped potential when it comes to Joensuu, and so far he is off to a good start when it comes to making a last gasp impression to the coaching staff and management. He got almost 16 minutes of ice time Saturday night, and given what he did with it, will continue to log significant minutes in the final three games. I was disappointed with the way that Josh Bailey played. He only got 14 minutes of ice time, and to me was rather invisible. As he gets slightly less ice time and more is given to guys like Joensuu, especially with players like Frans Nielsen now missing time, one has to wonder about his future. He will be an RFA this summer, and hasn't done a ton to warrant a huge pay raise. It'll be interesting to see how that all plays out. The Isles had to patch together a defense, but I felt they played pretty well. Dylan Reese in the past two games has looked the way he did for a majority of the games to end last season. Mark Katic has looked good to me considering his size and what he is. With the Isles on a 6-on-4 advantage, Katic did fumble the puck that led to the Staal empty net goal, and that is one play you can definitely chalk up to inexperience. But aside from that, I thought he looked steady, picked his spots as far as when to jump into the play and was very strong positionally. Meanwhile, Ty Wishart and Jack Hillen both returned after suffering injuries against the Rangers and got very limited ice time. That gave both Katic and Reese the opportunity to log 20+ minutes, and they did quite well with it. I would imagine now with a few days off Hillen, Wishart, Bruno Gervais and Milan Jurcina will have plenty of time to rest up. I'm not really anticipating many of those guys to practice these next few days. Al Montoya wasn't really tested with anything incredibly tough. The Carolina goals were from some tips in front, particularly Cole's goal. That's one instance where the defenseman has to do a better job there, especially on someone who has made a career out of scoring big goals in front like that. But Montoya made most of the saves that he should have and doesn't really get much blame in this one. In a way, this was like the tale of two games. For most of the third period, the Canes wanted it more and you could feel their desperation and their pressure. At that rate, you knew it was only a matter of time before they started to break through. There's a reason they are still in this race with so little time left. The Isles have off until Wednesday when they go into Boston to take on the Bruins. That is going to be one tough game. But, the last time these teams met the Islanders stunned the Bruins and beat them 3-2 at the Coliseum. So, we can definitely say that stranger things have happened. But while the Isles have been on a good run since that point, the Bruins have as well. NYI FYI SUNDAY: Just a friendly reminder that we will be on live tomorrow at 11 AM. You can tune in by watching us on our NYI FYI UStream page. There you can watch us in real time, as well as participate in the live chat. So be sure to come prepared with your comments or questions. We have a good show planned for you guys as we'll discuss the team's play this week, the re-signing of Al Montoya, the PHWA boycotts in honor of Chris Botta and more. Remember - Sunday at 11 AM! Thursday night's installment of the Islanders-Rangers rivalry had a lot more riding on it than some people may have thought. Just a week earlier, the Rangers were in 7th place by a decent margin and giving the Montreal Canadiens a run for their money. But a couple of losses coupled with some wins by the Buffalo Sabres have put the Rangers in a very precarious situation as they are tied with the Sabres for the 8th spot. Surely they would come out flying and give the Isles quite the battle, right? No, not really. Despite an early goal from Vinny Prospal on a really nice play to Al Montoya's left, the Islanders came back and scored four goals in the second period on their way to a 6-2 win over their rivals. The Rangers had seven chances on the power play, and didn't look good at all on some of them. For some others, the Isles penalty killers did a fantastic job. Montoya came up big and made some really nice saves when he had to. He only allowed two goals on 27 shots, and frustrated the Rangers. The smile on his face after the game said it all as he finally got a win against his original team. The Islanders lost a couple of players to injury during the game, as Frans Nielsen was hit from behind by Marian Gaborik and Ty Wishart suffered a shoulder injury after a collision. Nielsen has a head injury, and it will most likely be determined that it is a concussion. The NHL failed in not suspended Gaborik for at least a game. So much for the consistency that we spoke of during the radio show last weekend. Hopefully Wishart isn't out for any significant time. He was playing really well and moving the puck well throughout the first two periods of the game. Any time he has come up to fill in on defense, Dylan Reese hasn't looked great. But on Thursday night he played well, looked good positionally and even had three assists. Trevor Gillies would score the final goal of the game for the Islanders. The fact that it happened was a perfect icon for how the game went for the Rangers. Speaking of Gillies, the game had a lot of intensity to it but once the pendulum swung in the Isles favor, they had most of the hits and won most of the fights. The Rangers are now left with four games to break a tie for 8th and keep the Carolina Hurricanes away, and they only trail by three points. Henrik Lundqvist was pulled in this one, but was seen limping for much of the day prior to the game after suffering an injury in Buffalo. He didn't look too good at all, and perhaps the injury threw him off a bit. The Rangers have a very tall task ahead of them given how the Hurricanes have played of late with the pressure on. The Isles take on those Hurricanes Saturday night, when every Ranger fan undoubtedly does a 180 and roots for the Islanders. The Isles haven't fared too well against the Canes this season, and the last time they were here they beat the Isles 4-1 on a blizzardy night just before the all-star break. NABOKOV NEWS: Believe it or not, Evgeni Nabokov's name has resurfaced again with the goalie looking for permission to go to play for Russia in the World Championships. While Nabokov admitted he wasn't talking to the Islanders directly, there were some conversations going on. Today it was reported that the Islanders weren't returning calls from the KHL, and the Islanders haven't submitted Nabokov's permission slip. What goes around, comes around. Good on the Isles to take a hard stance. Bad on Nabokov to not be a good soldier in the first place. DONOVAN'S DEAL: The Islander signed defensive prospect Matt Donovan earlier in the week, which was speculated for a long time. The Islanders had to make a decision on him this year, and he has played really well for the University of Denver. The Isles drafted Donovan out of the USHL, which has become a bit of a hot bed of sorts in the past decade when it comes to producing NHLers. The Islanders have fared well with all of the guys they got from the USHL, starting in 2006 with Kyle Okposo. The Isles have to make some decisions on some other guys, but many of them are still playing in the playoffs. As time goes on, we'll get some more news on those individuals.